Gennady Golovkin retained his three world titles Saturday, fighting to a draw with Mexican star Canelo Alvarez in a showdown for middleweight supremacy that lived up the hype. Byrd’s lopsided score didn’t reflect the explosive drama of a bout in which Golovkin moved forward aggressively while challenger Alvarez was the counter-puncher with sometimes faster hands. Despite the draw this was Alvarez’s coming out party in the higher weight class as he delivered a performance that established himself as a bona-fide middleweight. He had won seven straight fights since losing his only fight to Floyd Mayweather in 2013. Alvarez, who is eight years younger than Golovkin, is entering his prime and will certainly move up on the pound-for-pound list. “We used the ring. We used the ropes and we fought in the centre of ring. We did exactly what we prepared for,” he said. Golovkin won most of the early rounds but then got hammered a few times with Alvarez’s uppercuts and right hands and seemed to be the more tired of the two near the end. Golovkin said he expected Alvarez’s game plan to include a few surprises and the former two-time champion Alvarez didn’t disappoint. In the fourth round, Alvarez tried to press the attack, but he paid for it as Golovkin got the better of those exchanges. There were very few clinches in the fight as both did damage in close. In the eighth round they each landed sharp uppercuts that snapped their opponent’s head back. The 27-year-old Alvarez’s best round was the 10th, when he stunned Golovkin with a vicious right hand to the head about 30 seconds in. Alvarez tried to finish him off but Golovkin survived and once he shook off the cobwebs the two continued their brawl on the ropes and in the centre of the ring. “I wanted to finish him off but he was a stong opponent with a lot of experience. It didn’t unfold the way I wanted it too,” Alvarez said of the round. Golokin’s trainer Abel Sanchez said Alvarez fought the way they expected him to. “No surprises. We knew going into this would be a war. Canelo was very resilient,” Sanchez said. 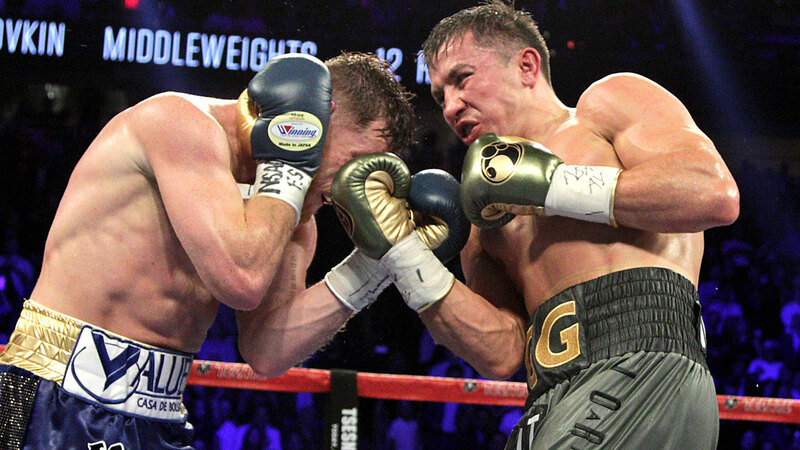 Byrd’s one-sided score was heavily criticized by Golovkin who called it “unbelievable”. De La Hoya though insisted there was nothing shady going on.